Project Perfect Mod :: View topic - Japanese Self Defense Force. Posted: Fri May 30, 2014 2:10 pm Post subject: Japanese Self Defense Force. 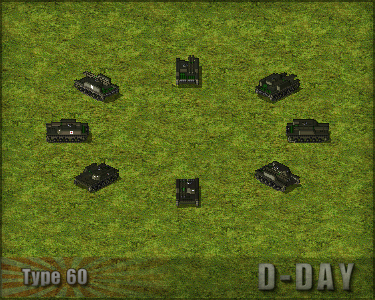 This is part seven off the Japanese units and the last of their ground vehicles. All of them were built Post-War in the late 1950s and early 1960s by the Japanese Self Defense Force. At the moment they can only be built in the Total-War game mode. In the future I would like to add the JSDF as a sub-faction in the Post-War mode. However research into a JSDF tech tree is still ongoing and I might not be able to find enough units to fill all the needed roles. With the outbreak of the Korean War in 1950 the American forces in the pacific were doubtful if they could defend Japan from future communist expansion so Japan was allowed to rebuild and rearm its military forces. The newly created Japanese Self Defense Force issued a requirement for a full tracked armoured personnel carrier and by 1957 both Komatsu and Mitsubishi submitted prototypes, the Mitsubishi design won and became Japan's first armoured fighting vehicle since World War II. The Type SX 60 was a 107mm mortar carrier based on the Type SU 60 APC. The mortar was fitted in the troop compartment and fired through a hatch in the roof, it could also be dismounted and used on its own. Only 18 were built and they were used until the early 1990's. The Type 60 was Japan's first post-war tank, designed specifically to ambush and destroy invading enemy tanks. 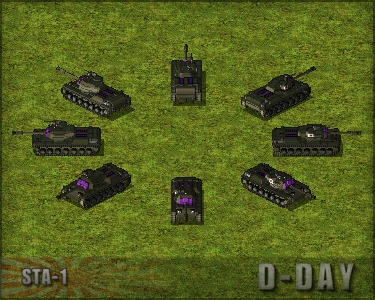 Development of a light tank destroyer was started in 1955 and within a year the first prototype was finished. Soon after it was decided to change the armament from the Japanese 105mm recoilless rifle to the American M40 106mm, to fit this weapon many changes had to be made and so another prototype was built. After tests it was decided to build a third prototype with an improved engine and transmission, so after five years of development and multiple variants the design was finalised and put into production as the Type 60. To help with the rebuilding of Japan's armed forces in the beginning of 1950's America gave the JSDF 200 M4A3E8 Sherman tanks, however they were becoming obsolete so a replacement was soon needed. The Americans then offered them the M47 Patton, however it was too wide to be used on the Japanese rail network. The height of the average Japanese male was also a lot smaller than an American so many of the Japanese drivers found it hard to operate. Because of these problems it was decided to design a completely new indigenous tank to fit Japanese requirements. The STA-1 was the first prototype and featured an distinctive low turret ring and high engine deck. This helped keep the height of the tank as low as possible which was deemed important for the role of ambushing enemy tanks, however this restricted its ability to fire to the rear. At the same time work on simular design with a more standard layout was finished and built as the STA-2, this design was prefered and so development of the STA-1 was stopped. The Type 61 was Japan's first production medium tank since world war 2 and was the end result of the STA development program which started in 1955 with the STA-1. After the STA-2 was chosen over the SAT-1 development continued with the STA-3, which added some new experimental equipment that was later deemed too expensive and so removed in the next prototype. The STA-4 went on to successfully completed all its tests and was put into production as the Type 61. 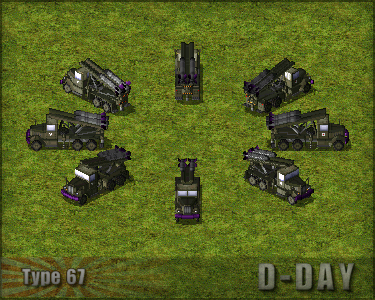 The Type 67 is a relatively unknown rocket artillery system with little to no information available in English. During world war 2 Japan developed several types of large rocket system but all were launched from rails on the ground. The Type 67 was Japan's first and only mobile heavy rocket launcher, using a modified Hino ZC 4ton truck carrying two Type 68 30cm rockets. The Type 67 was mainly deployed to Japan's northern island of Hokkaido to defend against any possible threats from the Soviet Union or China. Thankfully it never needed to fire a rocket in anger, however on several occasions it was used to defend Tokyo from Godzilla! Tomorrow I take off to the skies with the Japanese fighter planes.